The Bang Saen round the houses meeting is on again, after a very well run and successful event last year. I will have more details next week, but it is a three day event spanning November 7, 8, 9 and is held on the public roads through Bang Saen. All the usual touring car classes will be there including the Super 1500 class which is having a six hour endurance race on Friday 7. Just like the Singapore Grand Prix last month, the race circuit is around the public roads in Bang Saen, which will closed to normal traffic for the weekend. There are parking areas for spectators, so you can get in and out of the area. I have a special interest in the Six Hour race, as I have been selected by the Pizza Company to co-drive in the Six Hour with fellow ex- pat Paul Kenny. I believe the format is 3x2 hours, with one hour break between each leg, allowing the local traffic to use the road for that hour. The cars will be kept in parc ferme for that hour and cannot be worked on until the next leg of the race starts. Paul and I were looking good for a podium in 2007 for the Four Hour at Bira until the relay to the fuel pump packed it in. Let’s hope we can do better this time. AA Insurance Brokers, my personal sponsors will be with me again for this event, and I will have more details next week. Love to have you there with us on the sidelines, and give us a wave. Last week I wrote that Frederick and George Lancaster used an all-wood unitary construction in 1922-23, but never used it in production. I mentioned that another manufacturer did just that 38 years later, and I asked which one was it? This brought in a good response, but many confused ‘unitary’ construction with bodywork. Morgan and MG used ash frames for the body for many years, but it was Marcos who built the chassis out of wood in 1960 with the Marcos GT. Hevin Maguire was first in and best dressed. Congratulations Kevin! So to this week. The KdF turned out to be a very popular car. Who designed it, and who sponsored it? As always, the financial pages of any newspaper can yield all sorts of interesting items. The latest being that various banks and financial institutions are now telling their senior staff to fly economy class to cut down expenditure. So where will that put Eff Wun? A few years ago, almost every top team was being bankrolled by tobacco companies. With tobacco advertising having been outlawed, the other big money organizations stepped in - banks and insurance companies - and so we have the Royal Bank of Scotland (RBS), HSBC, ING and others on the side of F1 cars. Now, with the banks having to be supported by governments, will the sponsorship mega dollars still be available? Rocket scientists need not apply. The answer is fairly obvious. The Armageddon GP is on the cards. So how much money has the F1 circus spent? According to a report from industry monitor Formula Money, F1 team owners splashed out a combined US$1.6 billion in 2008 following the arrival of Indian billionaire Vijay Mallya’s Force India team (Team Vindaloo). That was up from US$1.47 billion in 2007. F1 is not an essential part of the world automotive scene, and the new (and very expensive) racing circuits can survive on lower categories (for example, Macau does well with just F3 and touring cars). F1 team bosses will be very fearful of 2009, and with reason. They might have to fly Economy too! When did you last check the tyre pressures? 1. Check your tyre pressure at least once a month. 2. Tyre pressure should be checked against the vehicle manufacturer’s recommended level. This can be found in the vehicle handbook and on a plate which is often located inside the fuel filler flap or on the driver’s door sill. 3. Check the pressure when tyres are cold (i.e. when you have traveled less than three km). 4. If you are carrying a full load of passengers or luggage or will be towing a trailer or caravan, tyre pressures should be increased in line with the vehicle manufacturer’s recommendations. Details can be found in the handbook. 5. Ensure a reliable and accurate pressure gauge is used. The one at your local petrol station is not really accurate. 6. Check the pressure in all four tyres not forgetting to check the spare tyre as well. 7. While checking pressures, give the rest of the tyre a visual inspection. Remove any stones and other objects embedded in the tread. Look out for any bulges, lumps or cuts. 8. If you are unsure on any aspect of tyre pressure or tyre condition take your vehicle to an approved fitting centre and speak to the experts. Despite promoting hydrogen power for some years, with hydrogen 7 Series under test, BMW will release about 500 electric Mini test cars in the USA from next month. This is an important milestone in many ways. A volume manufacturer is releasing a significant number of electric cars into the general market. With the OPEC cartel now agreeing to reduce production of crude oil to artificially jack up the price (and hold you and me ransom at the pumps), this will stimulate research into all-electric cars. And not before time, I might add. I am tired of buying 36 hole golf courses and six star hotels in the desert! This variant of the Mini theme is called the ‘Mini E’, and is totally electric, not a hybrid, and uses lithium-ion battery technology. It will be unveiled at the Los Angeles Auto Show in November before being leased to selected public and corporate customers in California, New York and New Jersey. BMW believes it will be the world’s first manufacturer of premium vehicles to offer an all-electric vehicle. All 500 or so examples will be built by year’s end at the Mini’s regular site in Oxford in England, with the electric drive-train produced in Germany. Power comes from a 150 kW electric motor mounted transversely at the front, producing peak torque of 220 Nm from standstill and driving the front wheels as per regular models but via a single-stage helical gearbox instead of the usual manual or torque-converter automatic gearbox. Performance figures released by the factory claim zero to 100 km/h in 8.5 seconds, and is limited to a top speed of 152 km/h. The Mini E is only a two seater, compared to the normal Mini, as in place of the rear seats is a high-performance lithium-ion battery, giving the Mini E a range of more than 240 km. This is more than enough for commuting. The battery has a storage capacity of 35 kWh and it transmits energy to the electric motor as direct current at a nominal 380 volts. It can be recharged using a standard household power outlet and consists of 5088 cells grouped into 48 modules, which are packaged into three battery elements, taking up most of the back-seat area. BMW hints that series-production electric Minis will probably reclaim their back seats. Again, the factory claims that recharging will only take around 2.5 hours using the BMW supplied standard ‘wallbox’ that can be plugged into a socket and ups the amperage for fast top-ups. 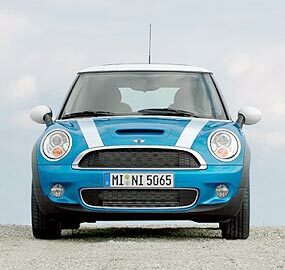 BMW will provide one with every Mini E, as amperage and voltage from the grid can vary wildly, thus increasing charge times. The Mini E also has a Kinetic Energy Recovery System (KERS) which under deceleration returns the kinetic energy back into the battery and thus extending the Mini E’s range by up to 20 percent. Up to 75 percent of all deceleration can be done without once touching the brakes, according to BMW. As a result of the heavy battery pack in place of the rear seats, the 1465 kg Mini E weighs around 400 kg more than the Cooper 1.6 petrol manual. Nevertheless, and despite the resulting different weight distribution properties this brings, BMW claims that changes to the suspension and the dynamic stability control program take the altered mass into account. BMW said it wanted to make zero-emissions vehicles as fun to drive as those with a conventional internal combustion engine. The brakes, electric power steering and air-conditioner’s electric compressor have also been modified or boosted compared with the items found in regular Minis.